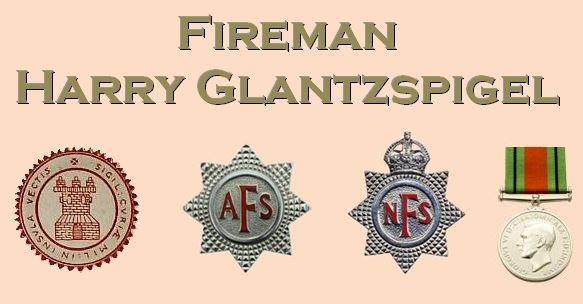 Fireman Harry Glantzspigel was killed due to enemy aerial bombardment on 3 January 1943 aged 32. Harry was just two years old, a Russian born Jew, when his family emigrated from their home to England. Harry's father Lewis, a hairdresser, who had found lodgings for his wife and young son at 55 Lichfield Street, Bow, reported to the Home Office on 20 February of that year to swear an Oath of Allegiance to the Crown and receive a Certificate of Naturalization. This was confirmed in the London Gazette a week later alongside a list of other European Jews, predominantly from Germany, Austria and Russia. Although Stalin wasn't yet in Office in Russia, his 1913 theories represented in the pages of Marxism and the National Question in places bears a stark similarity to Hitler's more notorious Mein Kampf of twenty years later. With such opinions gathering momentum it's no wonder that so many Jews took wise steps to find a new home. Whilst the pre-WW2 activities of Oswald Moseley stirred up ill-advised resentment in some parts of the UK, epitomised notably at the Battle of Cable Street in 1936, which was in close proximity to the Glantzspigel's home, their lives in London would surely have been far less threatening than under the rule of Stalin whose rise to power was imminent. In this respect Lewis's foresight and action was incalculably beneficial to his family's life and prospects. Little is known of Harry's younger life until the 1939 Register identified him living with his wife Sarah at 96 Sandringham Road, Hackney, earning a living as a salesman and window dresser while Sarah made dresses. In handwritten brackets the entry alongside both their names states known as Lewis, which suggests that they were using Harry's fathers first name as an alternate surname. It is suspected that Harry joined the Auxiliary Fire Service and saw action during the London Blitz. When the AFS was absorbed into the new National Fire Service in August 1941, Harry would naturally have been a part of that transition. On what date he was despatched to serve on the Isle of Wight isn't clear. Harry wasn't the only London fireman at Shanklin that day. It's only a theory but it's known that some of the London firefighters who had withstood the hell of the London Blitz of 7 September 1940 to 11 May 1941, were despatched to 'lower risk' areas in the aftermath to give them an opportunity to mentally recover. If that is the case it makes the random nature of his premature death all the more tragic in its ghastly irony. When the requisitioned Gloster Hotel, the temporary headquarters of the Shanklin Company of the National Fire Service, took a direct hit from a 500kg high explosive bomb, Harry was one of those inside and among the twelve killed instantly. Rest in peace Fireman Glantzspigel.